The traffic light is red, forbidding access to the intersection of Arnold Road and Governor Ritchie Highway (Maryland Route 2). Traffic flows north and south – cars, SUVs, semis, delivery trucks, busses, campers, boats on trailers, tow trucks – all traveling at breakneck speed. The air is filled with exhaust fumes, the sound of diesel engines, the ping of a gas station pump, a police siren; but high above it all, a mother osprey settles serenely on her nest atop a communications relay tower. Arnold’s commercial intersection is guarded by a huge modern Safeway grocery store, whose parking lot is always full. Across Arnold Road is an Exxon gas station and short stop. A furniture store occupies another corner – people use their parking lot to cut through and avoid the traffic light. On the fourth corner is the new TD Bank, flanked by Arnold Station Shopping Center. Also close by is the Von Paris Moving and Storage Company, a Sunoco station, BB&T Bank, and the Arnold Volunteer Fire Station. Yet go two blocks on either side of Ritchie Highway, and there are tree-lined streets with private single family homes. This is the dichotomy of Arnold, Maryland. Arnold is not a town, but has a post office. Arnold has no city hall, or mayor, but has a fire house. Arnold’s only elected officials sit on the County Council and State Legislature in Annapolis. 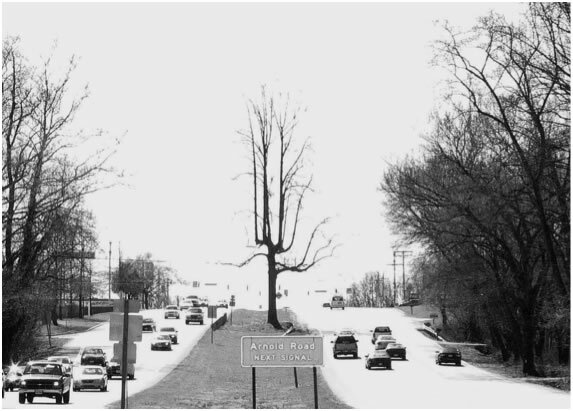 Unseen by those on the main highway, Arnold is a community of people, homes, schools, businesses, and, as of 1963, a zip code of 21012. How did the community get its name? The Religious Tolerance Act was an open invitation to those Puritan families seeking religious freedom, to come from Virginia (where the Church of England was mandated) to Maryland. 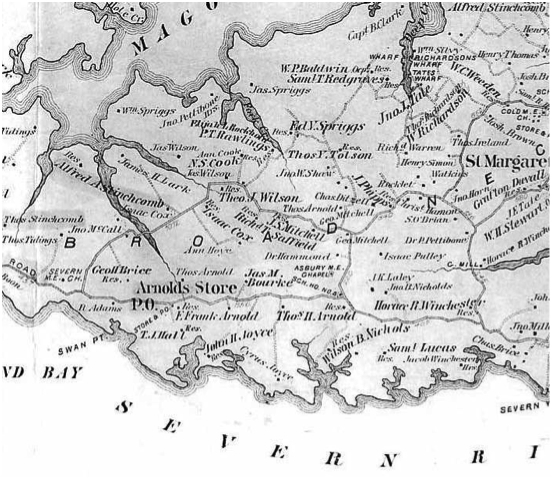 Anthony Arnold began the migration of the family from Kent County, Virginia to southern Maryland in 1670. We have reason to believe the Arnold family were Quakers, or Friends, as they called themselves. Several generations later, John Arnold bought a tract of land on the north bank of the Severn River known as “Hammond’s Security” for $1,756.50 cash. John Arnold lived in a house which still stands on Freshfields Lane in Arnold, Maryland. John requested to be buried between two trees in his back yard – some say to keep an eye on his young widow. John Arnold’s eldest son, Elijah Redmond Arnold, married Matilda Hammond, daughter of Dr. William Hammond. They lived in the area now called Rugby Hall. Records of the U.S. Postal Service indicate that a post office was established at Arnold’s Store in 1852. This building was Elijah’s home; the store was operated in the smaller building attached on the left. The building, after several renovations, still stands at the intersection of Old County Road and Baltimore and Annapolis Boulevard. In 1880 Edgar F. Arnold became post master, and the name was changed from Arnold’s Store to just plain Arnold. Thomas Hamilton Arnold, John’s second son, inherited his father’s land and became a leader in the community. When the Baltimore and Annapolis Short Line Railroad was allowed to pass through Thomas H. Arnold’s property in 1887, he became the station master at Arnold Station. Thomas Arnold owned a store near the tracks, about a mile and a half further south of Elijah’s home and store. The Arnold post office was moved to Thomas’ store, and renamed Asbury. The archives of Asbury UMC in Arnold contain a recipt from Mr. Arnold’s store in the year 1891, with the Asbury address. 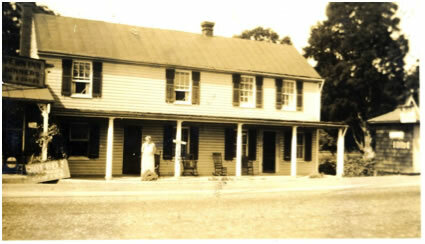 Mr. Arnold’s store became the center of activity as the railroad became an important access to the area. At first, all of the train stations were three sided sheds set beside the tracks. Mr. Arnold’s store, just across the tracks, had a long porch with benches where people could wait for the train, chat with neighbors, pick up their mail, or leave their muddy shoes for nicer ones to wear into town. Arnold’s store became the center of activity in the rural community. Finally, in 1902, the post office regained the name of Arnold, and Thomas’ grandson, Martin Steele, assumed the operation of the store and was named postmaster. The picture on the left shows Bill Schriefer, Ann Statt, and Clarence “Sonny” Jordan at the station in 1936. Thomas H. Arnold’s obituary in The Evening Capital gives us a pretty good insight into the character of the man who gave Arnold its name. Mr. Thomas H. Arnold died at Arnold’s station at midnight Thursday. He was in the seventy-sixth year of his age. He was a man of robust build, and until three years ago, enjoyed the best of health, when an attack of grippe left his with a complication of diseases. Two weeks ago he was taken to his bed with facial erysipelas, which was the primary cause of his death. In this illness he was attended by Dr. Zachariah Ridout and Dr. John M. Hayes; Dr. George Wells, of Annapolis, also being called in consultation. Drs. Ridout and Hayes were with him almost continuously from the time they were summoned and the very best attention was given their patient, but without avail. Mr. Arnold has had the respect of men throughout his life and for a half century has been prominent in the affairs of his county. A man of fine judgment, his advice was often sought. He was never a candidate for office, but in the famous fight of 1875, he was forced upon the ticket of that year for county commissioner. With other candidates on the ticket of that year he was declared elected, but after a contest in the courts the ticket was ousted. Mr. Arnold served for a number of years as one of the trustees of the Almshouse, resigning when ill health forced him to do so. Mr. Arnold was one of the largest land owners of this county and had been a very successful fruit grower. He was also engaged in merchandising. Mr. Arnold is the last survivor of the noted Wharton jury. It was he who stood firm for the acquittal of the prisoner, and after a prolonged lockup, the other eleven joined him in the verdict. Mr. Arnold was a loyal Methodist from early manhood until death. He was a member of Asbury Church, near his home. He gave largely and quietly to the support of the church he loved. The church has honored him in all the offices that laymen could fill. Failing health made it necessary to surrender much of this service, but as an attendant upon divine worship he was there until the last. Mr. Arnold was married twice. His first wife was Miss Rebecca Waring, of Prince George’s county, and the second was Miss Eliza Waring, a sister of the first Mrs. Arnold. His widow and eight children survive him. His sons are Messrs. Alton R., R. Harry and Severn K. The daughters are Mrs. Wilson B. Nichols, of Baltimore (Alice Virginia), Mrs. J.L. Kibler, wife of Rev. J.L. Kibler, of Roanoke, Va.(Angelica Rebecca); Mrs. Thomas L. Gladden of Lexington, Texas(Mary Blanche), and Misses Lida M. and Minnie M. Arnold. Mr. Arnold’s tombstone in the historic Asbury Church Cemetery is a lasting and visual reminder of the man who gave the community of Arnold its name. His mother, his wives, many of his siblings and his children are all buried around him. Also surrounding him are graves of many of his friends and neighbors, all of whom had a part in the settlement and history of Arnold, Maryland.